English lawyer and communal worker; born in London 1856; educated at University College and the University of London (LL.B.). One of the founders of the Hampstead Synagogue, he is also one of the chief promoters of the Chovevei Zion Association in England, and assisted in affiliating it with the Zionist movement under Dr. Herzl. In that capacity he attended the Basel Congress of 1898, in which he was a member of the presidential council. Later, when the somewhat diverse aims of the two associations became apparent, Bentwich severed his connection with the English Zionist Federation. He organized the Maccabean Pilgrimage to Palestine, 1897. Bentwich is an authority on copyright. 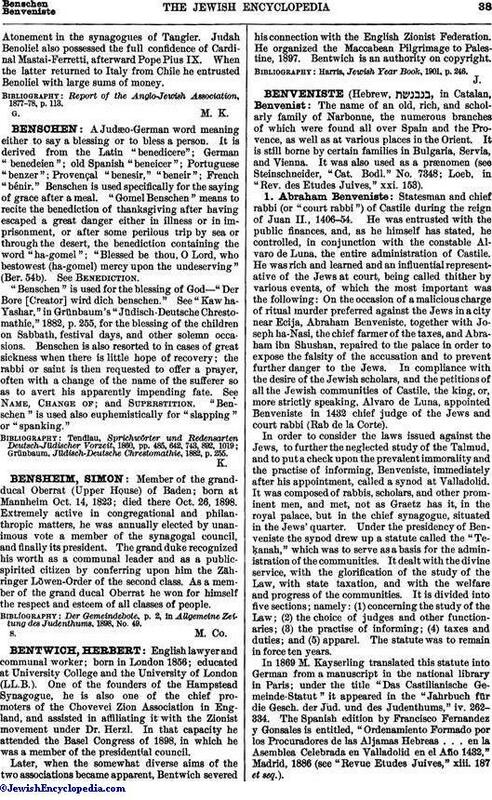 Harris, Jewish Year Book, 1901, p. 246.